As the largest contributor of pollution to the Puget Sound, stormwater runoff pollutants affect our ability to eat seafood from our local waters by diminishing aquatic habitats, causing disease to wildlife and straining the commercial fishing industry. We want flora and fauna to be free from preventable diseases, and we want our local economy to thrive. Additionally, more pollution means more money and time towards the management and treatment of stormwater. Last but not least, we care about stormwater pollution prevention because we want to protect the natural beauty of our community. Low Impact Development (LID) is an approach to stormwater management and site development that minimizes the amount of stormwater carried in piped stormwater systems and reduces incidents of urban flooding. LID uses a variety of small scale site features like raingardens and pervious paving that allow rainwater to soak into the ground. The water travels slowly through the soil, and many pollutants are filtered by the plants and soil microbes before flowing into the waters of Puget Sound. 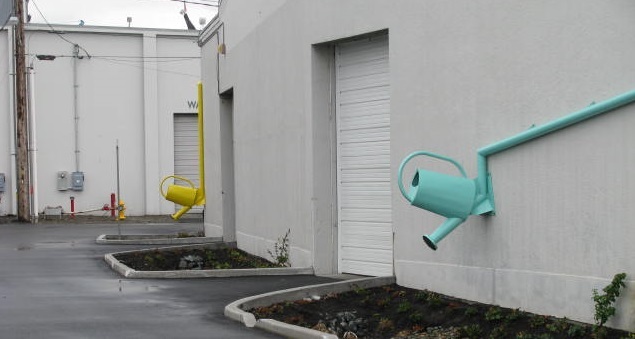 You may have noticed these watering cans outside of Cortland’s warehouse on Railroad Avenue. 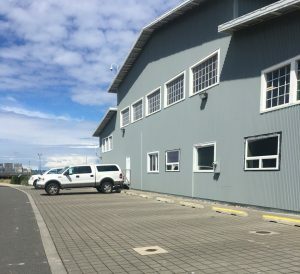 The Port partnered with Skagit Marine Resources Committee to incorporate LID features at this port-owned building. Water from the roof of the warehouse is channeled through these oversized watering cans that gently and evenly distribute water to the rain garden plantings. The main Port office parking lot was also constructed with pervious paving. Pervious concrete pavers are designed to slow the volume and rate of stormwater runoff, allow groundwater recharge and help filter pollutants. Stormwater flows through the gaps between the pavers into the gravel subbase, where it is stored and slowly infiltrates into the ground. Pervious paving parking lots can also be found at the Port’s Seafarers’ Memorial Park.